FASHIONCLASH presents: the 3rd edition of the Fashion Makes Sense Award (FMSA), a supportive award for a new generation of fashion designers with innovative disruptive ideas that can contribute to a development of a more sustainable fashion industry. FASHIONCLASH is looking for 10 fashion designers/labels who design and create sustainable fashion or would like to. During the FMSA, two awards will be handed out: an audience prize of €1.000,- and the jury prize of €2.500,-! The aim of this project is to offer a new generation of designers, with innovative and sustainable ideas, a stage and to encourage designers to think about sustainability. In addition, the project aims to create awareness about sustainable fashion among a broad audience. Are you interested in participating ? Please read the information on this website carefully and sign up before Wednesday the 1st of May 2019! FASHIONCLASH selects 10 designers/labels out of all entries. Each finalist will present/exhibit 1 outfit at Cube Design Museum in Kerkrade (from Saturday 28th of September 2019 until Monday 20th of January 2020) and 1 outfit during FASHIONCLASH Festival in Maastricht (Friday 1st- and Saturday 2nd of November 2019). The winners of the two awards will be announced during FASHIONCLASH Festival on Saturday 2nd of November 2019. The jury award consists of an amount of money intended for the development of a sustainable collection. For the audience award there is an online voting and offline voting. More info, please check the 'General Information' page. Designers/labels who work sustainable or who are willing to work in a sustainable way can apply for the FMSA before Wednesday the 1st of May 2019 by filling in the application form and by sending accompanying photos/drawings/mood board of the collection. 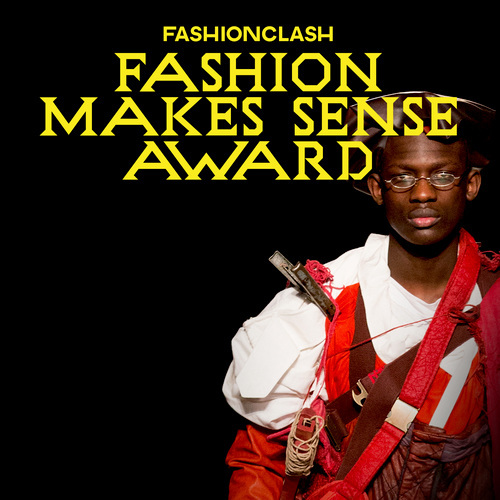 FASHIONCLASH will announce the ten finalists in week 19 (starting from Monday 6th of May). Would you like to get the chance to win one of these awards? Sign up and complete the application before the 1st of May 2019! We look forward to receive your application!